Posted on April 18, 2018 by revivewa	in News and tagged 1. Dutch musician Arjan Breukhoven will visit Australia for the sixth time for a series of ten organ concerts in the Perth and Albany regions of WA. Arjan is well-known in the Netherlands as an organist, pianist and conductor. He is musical director of three large Christian male choirs in the western part of Holland and is starting a new choir project in Western Australia. You are invited to join this project by singing in the Australian Christian Men’s Choir with Arjan as conductor. This Christian men’s choir will have five rehearsals in the Free Reformed Church of Kelmscott on Thursday evenings, starting on 5 July at 7.30pm. During the rehearsal there will also be a break, since it is important to connect with the other singers and socialise. After these five rehearsals there will be a concert at St John’s Anglican Church in Fremantle and it will also join in with a community hymn singing in the Free Reformed Church of Kelmscott. The repertoire consists of well-known Christian hymns. Beside these hymns the choir will also sing spirituals and classical works during the program. During the concerts Arjan will also play some organ and piano solos and the choir sing beautiful psalms and hymns together with the audience. The choir are searching for male singers with and without singing experience. Send an email to australianchristianmenschoir@gmail.com for further information and sign up for this project choir. After signing up, you shall receive the music scores via email and also receive mp3 files to practice at home. If you don’t have a computer you can get a CD with the music for practice. 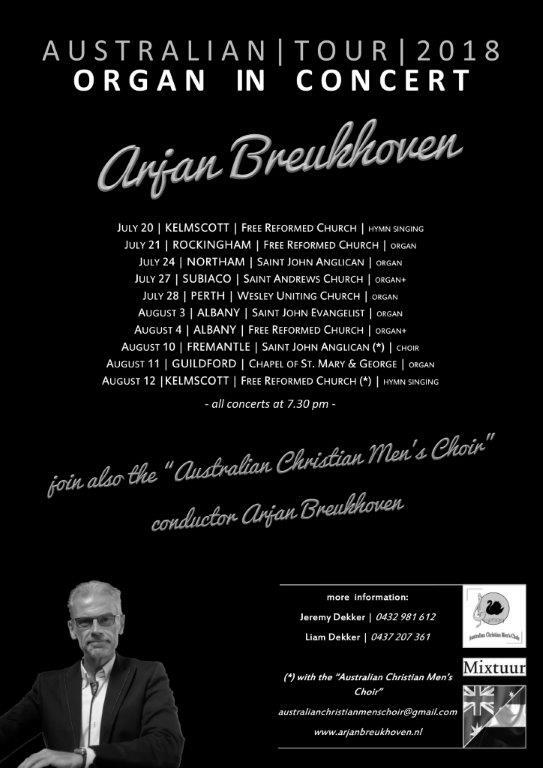 Arjan Breukhoven shall give the concerts in Australia from July 20 till August 12 2018, including a performance at Uniting Church in the City, Wesley Perth on Saturday 28 July, 7.30pm. For more information about the concerts visit www.arjanbreukhoven.nl/agenda or phone Jeremy or Liam Dekker on 0437207361.